The weather forecast for my long run tomorrow morning is looking perfect enough (temps in the teens but no snow or ice) which means I can run outside. I am excited about this, of course, but if the weather by you isn’t going to be ideal for outdoor running, that does not mean you automatically skip your long run. If you want it bad enough and have access to a treadmill, you will learn to make it work for you which is what I am here to chat about today. 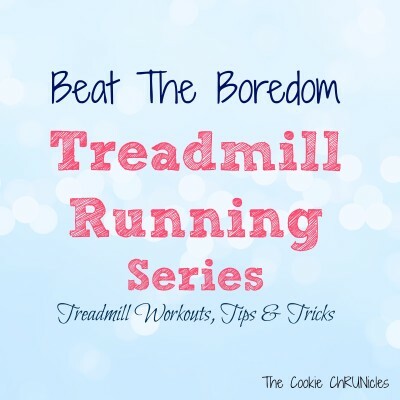 Before I get to the pacing workout I followed last week on the treadmill, let’s talk about preparing for your long run indoors. Dress for indoor running – I said this last week but it’s worth remembering again. It may be freezing and snowing outside but inside it is hot and you will warm up really fast. Don’t forget your mid-run snack – I am totally guilty of this and sometimes I don’t know why. I have to be super conscious of not only remembering to bring my jelly beans but remembering to put them in the front pocket of my waistband, not the jacket I am wearing because I won’t be wearing the jacket on the treadmill! I also have to remember to start eating the jelly beans around mile six just like I do when running outside. Bring water – I get thirsty much sooner when running indoors. Think of your long run in smaller parts – For all of my long runs and ESPECIALLY on the treadmill, I group miles in my head, never thinking about the overall picture. Remember that most treadmills will shut off and restart at the 60-minute mark. 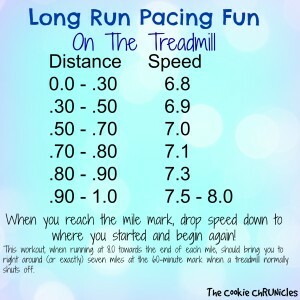 I hate this because I like to be the one in control of my run and don’t want to stop because the machine says I have to! To combat the problem, I will pick a mileage marker (let’s say every 5 miles) to voluntarily stop the belt before it can stop me. At that point, I either restart the belt or take a minute to use the bathroom, take a drink or pop a jelly bean before starting up again. By the way, there is nothing wrong with needing to stop at different points of your run. Of course we don’t want to on race day but if you need to use the bathroom, adjust your shoes, take a drink or a breather, don’t force yourself to wait. Just stop and then start again. The less pressure you put on yourself, the better. My biggest problem with running long on the treadmill is that I tend to go faster than I do outdoors. Long runs are mostly about endurance, not speed. Last week I created a long run workout plan for myself that would take into account my need to go a little slower while catering to my desire to go faster without overdoing it. Remember to adjust the speeds below to what works for you. You will note that I started the treadmill at my home pace, increasing slightly every so often with a push at the conclusion of each mile followed by backing off again. This workout, when pushing more towards the end (around 8.0 instead of staying at 7.5) brought me to seven miles within seconds of the treadmill shutting off making this a great routine if you are trying to get seven miles accomplished in one hour. Once you complete the first 60 minutes and if your treadmill shuts you down like mine does, simply restart the belt and this workout for as many miles as you have remaining. I want this. I am not stopping. Stopping short of my plan is not an option. And if that doesn’t work, picture how good it feels when you are finished and enjoying your favorite post-run meal. 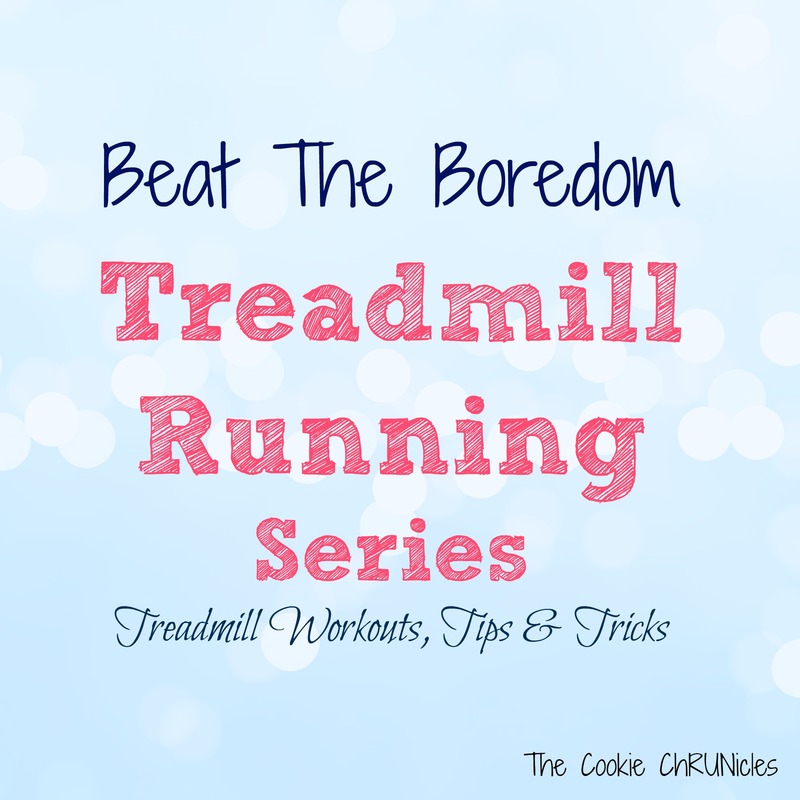 Click here if you missed last week’s treadmill workout. How is the weather by you? Will you be running long this weekend indoors or outdoors? Are you off on Monday? Long weekend plans? My longest treadmill run is 15 miles and I hope for that to be the longest, but I couldn’t agree with you more of breaking it up into smaller runs. I do the same thing. Anything to trick you mind helps. Happy Friday! I am hoping to get a run in tomorrow…not sure if it will be “long” by most standards but hopefully more than 6 miles. And the weather should be decent so I’m excited about that. I would have to say that statement is not always true because sometimes I just can’t handle food after a long run. But when I am starving, YES everything tastes better after a long run or hard workout! I am always starving after a long run. With races though, like if I run a 5k (which is rare) or sometimes even after a half, I am not starving — it takes about thirty minutes to really kick in. Ugh, did they say wind? I thought that was only for later today. Let’s hope the wind is calm in the morning. I can handle cold but not the wind and the cold! It is going to be positively balmy out here this weekend–in the 30s!! My limit for tmill runs is about 8 miles–the most that my brain and hamstring can take! It’s sad when we find 30-degree weather as warm. Sometimes I leave my jacket home when it’s that “warm”. That’s one thing I really notice about treadmill running is how much I sweat. It’s gross but also really cool, too. Like a science experiment. Ha! So yes, lots and lots of water. I get a really good sweat going on the treadmill. Yet when I run outdoors in the winter, my hair stays perfect (which is an added bonus). It’s such a great feeling when those kids wake up AFTER we complete the workout we wanted, right? I do the Pure Barre videos while my son is asleep praying he stays in bed until I finish lol. Amanda @ .running with spoons. recently posted…. strawberry coconut overnight oat parfait . Each time I run on the treadmill and finish, for sure I feel accomplished. And, it reminds me that I can do it and do things I didn’t think I wanted to complete or do at all. I also found last year after a ton of treadmill running in the winter that it helped me become a better outdoor runner. The mental side of sticking to things that I didn’t want to do and the speed work inside made me faster outside. Ha, your home pace is practically my sprint. I like the idea of bringing snacks. This appeals to me for obvious reasons. Any excuse for a snack right? I laugh when I am eating jelly beans before most people are awake. The perks of running! 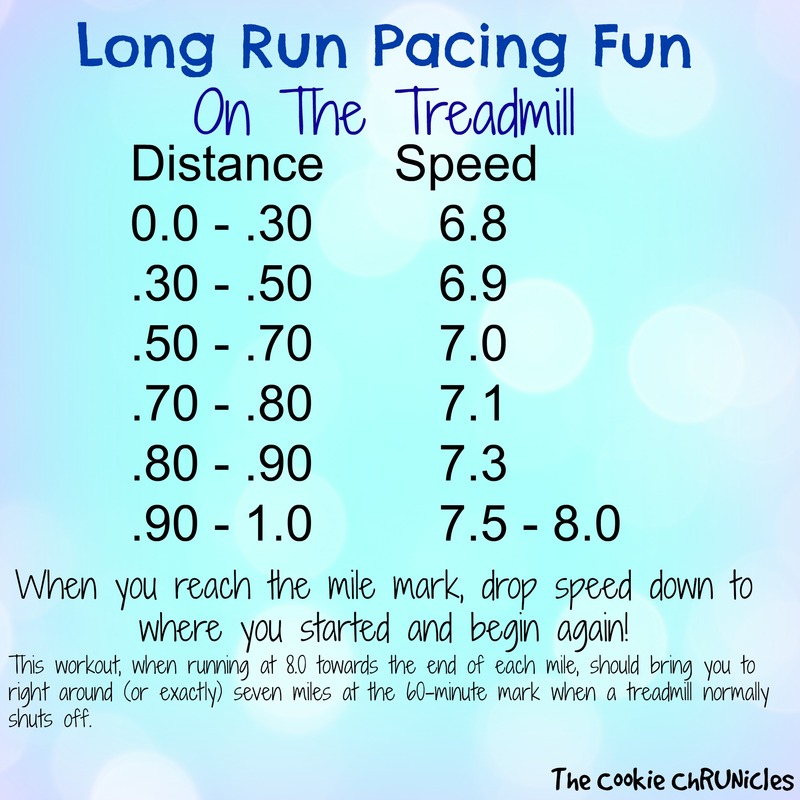 I’m a huge treadmill runner – it makes me happy and I prefer it for my early morning runs and any time it’s cold!!! Glad you have a plan for your long run!! A treadmill really is a great option – especially when it’s super early, late, snowing, frigid or you don’t want to go outside. Did my first comment post? Ugh, so frustrating sometimes! I was saying that the treadmill is a really great option especially when it’s super early, late, snowing or you just don’t want to go outside. I’m actually going to try and run outside tomorrow. But not a super long run. The roads around my house are really crappy right now in terms of ice/snow. Winter running = lots of loops in suburb streets! These are such great indoor running tips! I have so much trouble staying motivated on a treadmill. This is such a good idea. I’m filing this away b/c I have become a winter runner wuss and I went out and bought a TM last weekend for the times I am wussing out. Longest I have done on a TM was 10 miles. I was at the gym so I had people to watch and I listened to an audio book – that helped! And I DEFINITELY think of my long runs in smaller parts – even outside! For my 20 miler last year, it helped SO SO much to break it into 4, 5 mile increments!